**NOTE: you can use any kind of nuts you want, and you can use any kind of mild ice cream base. sky’s the limit. in a small saucepan, gently heat up the honey + half of the spice mix. take off the heat. place pecans in a bowl, pour honey spice mixture over them and toss until nuts are well coated. spread the nuts on cookie sheet, bake for 20 minutes, keeping an eye on them, stirring them every so often to promote even roasting. in a bowl, separate the yolks, keep the whites for another purpose (maybe meringue icing or a white cake? or in my case, an egg white omelet). next you’re going to temper the eggs. using a ladle, very slowly & gently pour the hot coconut mixture into the bowl of yolks, all the while stirring furiously. you are attempting to bring the yolks up to temp with the hot mixture, but not scramble them. you might need another ladle-ful. when the yolks are warmed through, pour into the saucepan and continue to stir, keeping temp an even low heat. meanwhile, using the remaining coconut milk, add in the potato starch and mix though. it will thicken a smidge, but the purpose of the potato starch is to discourage icicles from forming in your ice cream in the freezer. pour mixture into saucepan and just continue to stir. the mixture will be thick. remove from heat and allow to cool. when thoroughly cooled, strain through a fine mesh seive to catch all the peppercorns & cinnamon stick. cover and refrigerate overnight. next day, pour into ice cream maker and whirl according to your maker’s specifications. in the last 2-3 minutes, add in your nuts and allow to churn & mix through. can serve right away, or allow to freeze/solidify for a few hours. you guys, a one year ago this month i started this space. thank you so much for reading along. I always have those intentions too. I finally gave up on running, because I get bored. I just accepted not being cool 🙂 Instead doing some crunches on the floor whenever I can. i find running to be incredibly boring too! dw & i were just saying that we should incorporate another form of exercise to our repertoire, i said sit ups but i think we’re going to go for leg lifts. i’m already groaning! I love the spice, what a great ice cream! oh your goals are great! i’ll settle for making many ice cream flavors! This ice cream sounds absolutely amazing. Love all the spices in it! thank you sini. 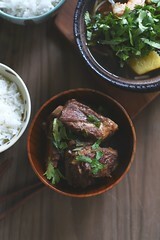 coconut can have such a certain taste to it, that can be too strong, i think the spices round it out nicely. Love this combination of flavors Lan! look at you and your husband exercising together, that is so nice. 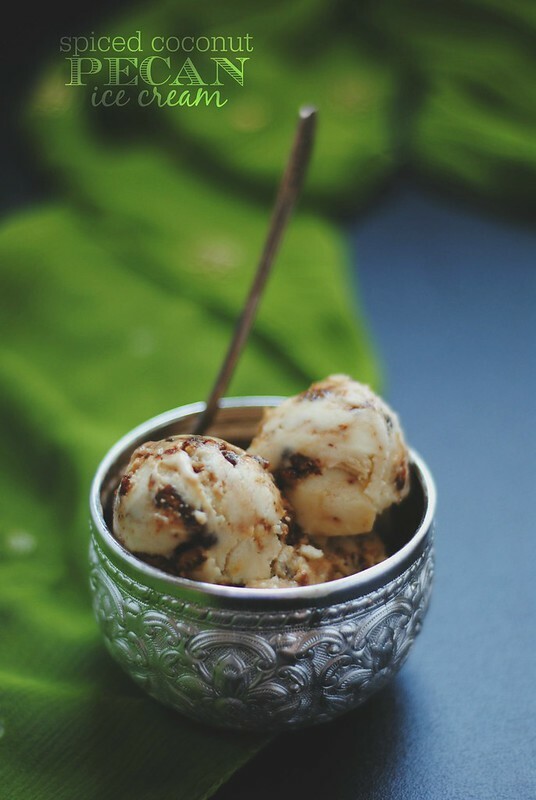 on an aside, you don’t have to add the nuts to the ice cream, you can have them spiced as a snack. in fact, quite a bit of it didn’t end up in the ice cream as we were munching on them …. I’ve been thinking about exercise. sometimes that’s all you need girl. Push-ups are too ambitious, it’s much better to rest on your back and feign working through a 20 min Pilates video; usually I take a nap after 10 minutes (all the stretching!). valerie, YES. i watch yoga videos sometimes with the reason that i want to prepare myself mentally for what’s to come, then restart the vid to do the actual steps… never happens! Happy One Year to this space! I love it here! 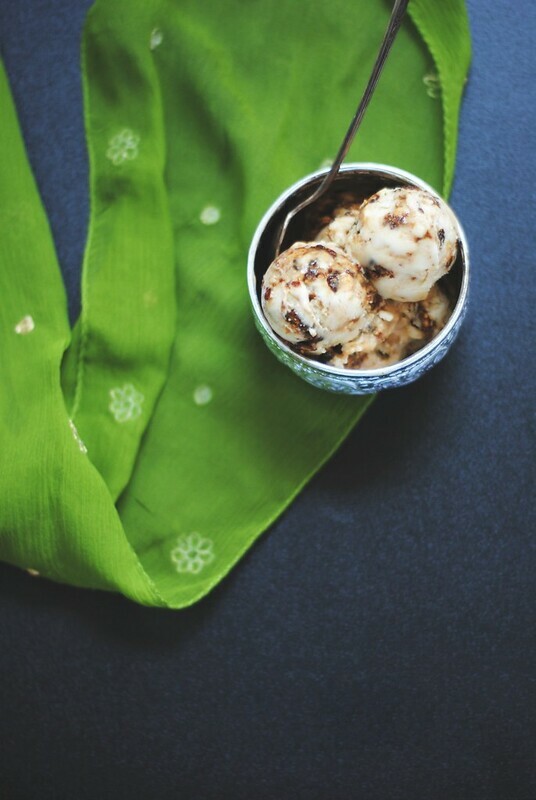 I love pushups as comic relief (mine would definitely promote chuckling……..), desserts as a reward, the flavors of nuts and all those warmed, exotic spices stirred into ice cream. That won’t even hurt your tummy. Wonderful! –Your photography has improved tenfold! I didn’t even know it could from a year ago, but there ya did it! sophie, you are always so very sweet and encouraging, thank you so much for your friendship! 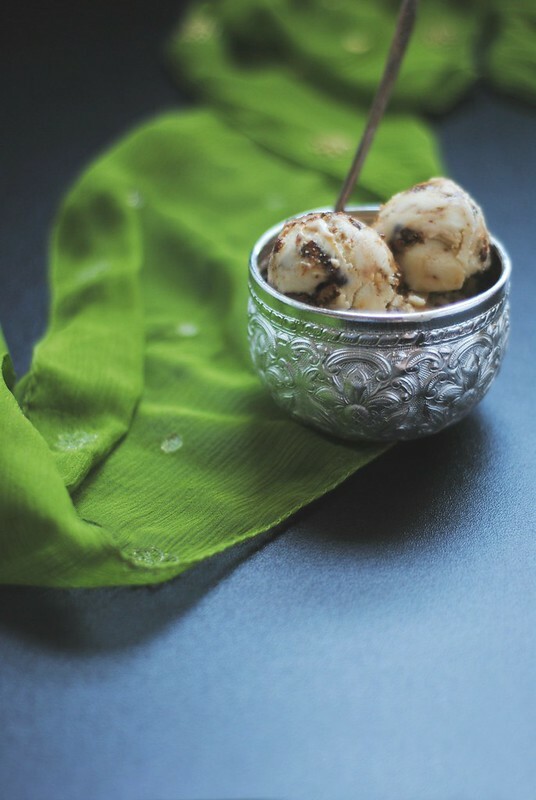 This recipe is mouthwatering; all kind of spices in ice cream is just brilliant. this looks like it would be really good, all the spices would compliment my fave Moroccan chickpea soup recipe. perfect dessert!